Jed Rubenfeld's The Interpretation of Murder has all the typical characteristics of a book that you'd buy at the airport to help you pass the time on a long flight. 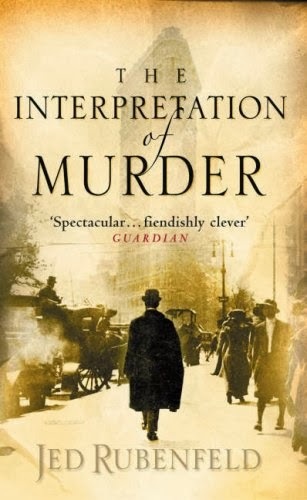 It has the word Murder in its title, and starts off with a beautiful debutante being murdered. It has the usual breathless reviews on both covers. And its pages seem to turn themselves. And yet, what sets the book apart is the detail - in the setting, in the characters, in the complex threads that make up the plot. The setting is New York in 1909, and what a setting it is. The city is transforming itself. Skyscrapers are raising their heads one after the other, a new 'tallest building in the world' is being inaugurated every two years. Mighty bridges are being built across the Hudson River. The society scene is glittering, the police force is corrupt, the people are heady with possibility. Rubenfeld's New York is so fast-paced, the energy almost seems to seep out of the pages. Into this scene arrives the founder of one of the latest fields in psychology - the field of psychoanalysis. Dr Sigmund Freud and his anointed successor Dr Carl Jung, both famous as yet only in Europe, arrive to give talks in the USA for the first time. Freud and Jung are not the only real people to walk the pages of this novel - there are lesser-known psycho-analysts, there are neurologists who are threatened by Freud's theories, there is the Mayor of New York City, there is at least one real-life psychopathic murderer. Indeed, it is Rubenfeld's incredible ability to weave together real stories and people into a work of fiction that makes this book such a joy. Reading the book, I couldn't wait to google and figure out who was real and who was not, which incidents really happened and which did not, which of the landmarks did exist and which did not. It's a good thing the author has helpfully provided a note at the end of the book with the details. Rubenfeld admits that he has taken some liberties with the chronology, but most of the things the real characters say are extracted from their books and letters. The discussions on psycho-analysis are quite fascinating, in fact - especially when you know the impact the theories later had on the world. I just realized that I've been raving so much about the setting and the characters that I've forgotten to mention a word of the plot - well, there are so many threads here that it's impossible to figure out where to begin. There's the usual murder plot-line of course - a beautiful girl is tortured and murdered, and an attempt is made to do the same to another. Then there is the politics of academia - scandalous rumours are spread about Freud so that his talks get canceled, mysterious forces try to play Jung off against Freud. There is a possible love story. There is the possible involvement of a convicted psychopath. There is a Chinese angle, brought in by a real-life inter-racial murder of 1909. Rubenfeld also throws around red herrings with a liberal hand, so that I for one had Carl Jung on my list of suspects almost till the end (it didn't help that Rubenfeld makes Jung sound like a most unpleasant character). At first, it seems impossible that Rubenfeld will manage to unravel all these threads, but he does. His two heroes, both fictional, a psychoanalyst and an NYPD detective, manage to figure out everything. Given the complexity of the plot, the explanation is necessarily torturous - but it's unexpected and therefore satisfying.